Any synthesizers with key tracking EQ? I was reading about making better string sounds with synthesizers, by using parametric eq to put in peaks and dips into the sound, to emulate body resonances, and was wondering if there were any iOS synths with unusual filters , like this, that can track the note you are playing? It is strange the world has universally settled on the resonant low pass filter for synthesizers. Sometimes hipass, some band pass, a few you can put two multi mode filters in parallel, or something, but I haven’t seen synths with something like a parametric eq, or little graphic eq, that you can track the notes with. 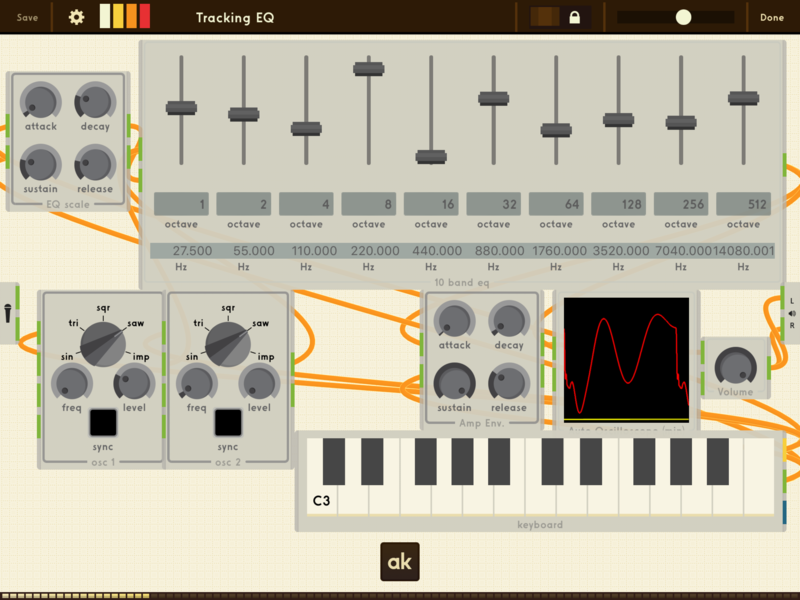 It would be best if it was built into the synthesizer, so you could get polyphony (one tracking eq per voice). One, functional, but not so fun workaround I could think of, is running a synth through an external eq, and getting one note to sound good, then sample that note, and play it in a sampler. Voila, tracking eq. Posted a quick version of this idea on the AnalogKit patch swap, making their 10 band graphic eq change center frequencies of each band with pitch cv. It did seem to be musical sounding, and interesting being able to tailor the different harmonics of your basic synth oscillators. One of the cooler sounds is sweeping the combined center frequencies of the graphic eq. My first thought is apeFilter + something like StreamByter to convert midi note to cc and map to filter freq. Will take some fiddling to get the mapping to be tuned right, but apeFilter would open up tons of options..
Alright, double scratch that. Apefilter's manual: "Send to apeFilter MIDI Note messages, to controls the Filtergraph Center Freq./Cutoff (Note Number) and Gain (Velocity)." So it does it already. If there's nothing wrong with that functionality (haven't tested yet) it should be a great fit for what you have in mind. Now I can't wait to be done with my obligations today and to play the center frequency of its crazy complex curves via midi note.